Sometime in 1983 my mother noticed that a high street chemist that also sold photographic and electrical goods was also selling ZX81 computers for Â£20. It wasn’t christmas or a birthday but she thought that it might be useful for me. It wasn’t even something that I had asked for. She just thought it might be useful. When we halved the polystrene casing we revealed the little black marvel, purest black with it’s name embossed in red. In case you ever forgot. I ran my fingers across its highly sensitive keypad and was sure I was witnessing something special. 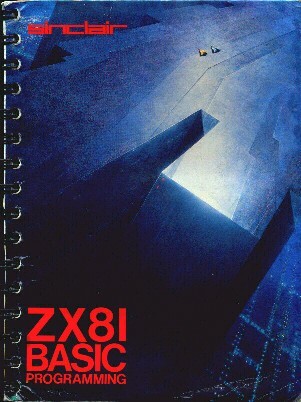 The form of the ZX81 is well known but for me as prominent in my memory was the little blue book which was the manual. I spent a lot of time reading and referring to the ZX81 basic manual. The art work as much imprinted on my mind as the little black flashing K that was the ‘ear’ of the ZX81. The cover of the manual is futuristic with two tiny spacecraft parked on top of some space port or something. Completely stark raving crazy but it’s futuristic look added to the mystique of this little black box. One of the great parts about Sinclair research was their marketing. Their products, although remarkable for the time, were very poorly built and unreliable. But somehow they created desire. The most memorable part of the book was a clock program from Chapter 19: Time & Motion. It’s hard to say quite what was so magical about this program, but I was awestruck when I ran it. The chapter doesn’t very clearly state that the code will draw a clock and a second hand but after typing it and pressing ‘RUN’ a numbered-dial slowly appears and then a dot sweeps around the outer-edge of the dial. For your pleasure I found a ZX81 emulator and typed the program in again and have recreated the magic for you right here. Pretty heady stuff, I’m sure you’ll agree. Over the next two or so years I spent a lot of time buying Sinclair magazines and typing in programs from them. It was great. You bought a magazine that you could read and then you could type in the program and also get a game to play. All for 60p. The games mostly blew goats and I spent more time checking my typing than playing the game but that didn’t really matter. One of Sir Clive’s great ideas was to attach keywords to the keys themselves. This meant that there wasn’t really any need for a full-parser because the ZX81 knew what to expect and would make the keyboard accept the right keystrokes at the right time. Whilst not terribly flexible this solution also meant that there was a whole lot less typing. I can’t claim that I learned a lot about computers or programming in those halcyon days but my cliche 1,000 mile journey had started with a single cliche’d step. I cherish the day that we met. You sit in a corner and you pick up dust.